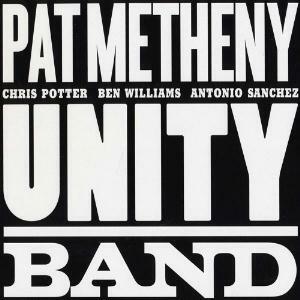 American guitarist and composer Pat Metheny has been one of my central jazz favourites since I got interested in jazz/fusion in the early 90's, but I haven't kept track of his latest output very closely. Orchestrion (2010) was very good, and exceptional in a way that Metheny is the only musician in it, playing 'orchestrion' (incl. pianos, marimbas, bells, basses, "guitarbots," percussion, cymbals, drums, loads of tuned bottles, and synth and fabricated acoustic instruments) with the use of advanced solenoid switch technology and pneumatics. Orchestrionics are occasionally heard also in this rather traditional-sounding contemporary jazz album, named after the line-up, ie. the quartet featuring Metheny, his trusted drummer Antonio Sanchez plus two new collaborators: Chris Potter (tenor & soprano saxes, bass clarinet) and Ben Williams (acoustic bass). All nine compositions are by Metheny who also produced the album. The opener 'New Year' gives a good picture of the whole album, centering on the acoustic guitar's mellow approach and the strong melodicism of the tenor saxophone. Superb 'Roofdogs' has the distinctive guitar-synth sound familiar from the Pat Metheny Group era. 'Come and See' expands the sonic pallette with some kantele-like guitar and a bass clarinet, while also the rhythm section sounds great. Also tracks 4-6 are safe enjoyments for a Metheny listener, balancing between delicacy and the jazz liveliness represented mainly by tenor sax. 11½-minute 'Signals (Orhestrion Sketch)' has more experimental vibes especially in the beginning, with live loops both from Metheny's Orchestrion -- lots of various percussion! -- and the band. Mellow 'Then and Now' gives the tenor sax very song-like melodic role. If the album in general feels slightly too safe and ordinary to the advanced Metheny listener, the fast-paced closing piece 'Breakdealer' will bring a welcome edginess. For me, this is a good Metheny album, not necessarily offering obvious, emotionally strong highlights like several Metheny albums I've listened to, but no mediocre tracks either within its nearly 66 minutes. Did I already mention that the playing of this quartet is excellent? I'd give 3½ stars if I could, but rounding it down (on the Pat Metheny scale!) definitely doesn't mean this wasn't very good contemporary jazz featuring guitar and the regular tenor sax in a pretty democratic quartet approach.